South Korea's presidential office welcomed the New Year's address by North Korean leader Kim Jong-un, saying it reflects his wish for the development of inter-Korean ties and Pyongyang-Washington relations. "Chairman Kim's firm commitment is expected to have a positive effect on resolving the Korean Peninsula issue smoothly in the new year," Cheong Wa Dae spokesman Kim Eui-kyeom said. In the half-hour long televised speech, the North's leader expressed his willingness to meet again with US President Donald Trump for denuclearization talks. The ruling Democratic Party also said it "brightens the prospects" for upcoming negotiations between Pyongyang and Washington. For its own part, the liberal party will do its best, together with the Moon Jae-in administration, for "epoch-making" progress in efforts for lasting peace on the peninsula, according to its spokesman, Hong Ik-pyo. But the conservative opposition Liberty Korea Party downplayed Kim's statement. 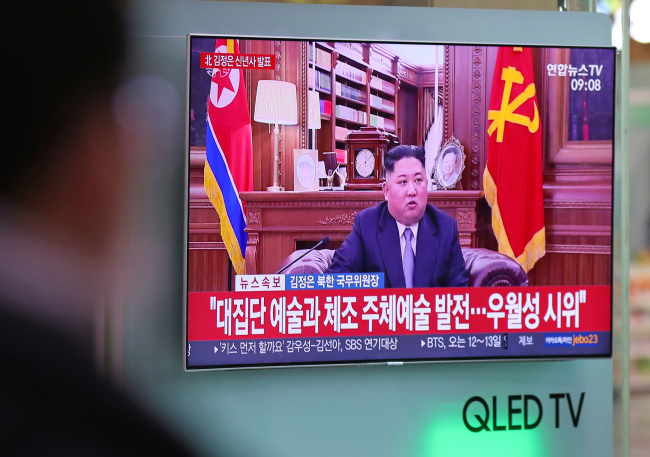 "There was no progress expected in the position on North Korea's denuclearization," the LKP leader, Kim Byong-joon, said. He said that the North's leader, who wants his nation to be recognized as a nuclear power, rather called for incentives, including the lifting of sanctions, and even threatened to jettison negotiations.